In a country where heavy rains can cause landslides, construction crews are redoubling their efforts on the 40 billion yuan ($5.8 billion) China-Laos railway project while the dry season lasts. The project, a joint venture between the two countries, will be the first to connect a foreign railway line with China's domestic railway system. It is also a major strategic project that has been promoted by the top leaders of the two countries, which have both pledged close cooperation. When imported construction materials and equipment got held up in customs in March, for example, the Laos government put things right, setting up a special lane for imports related to the project. The project has also benefited communities neighboring the construction site by providing jobs and demand for local products. "This is my office, and also my bedroom," Cai Li, a project manager, told Xinhua while pointing at a small tent amid the roar of an electric generator. Located on the construction site of the China-Laos railway in Muang Phonhong district in Laos' central Vientiane Province, Cai's "office and bedroom" consists of simple bamboo shelves covered by large plastic sheets. There is no work table, but only a bed, with office supplies placed on the floor. "We have only an electric fan to keep cool," the 50-year-old manager said. "I sleep only three or four hours a day these days. Fortunately, the chef arrived the day before, so we now have good meals." Cai arrived on the site of China-Laos railway in Muang Phonhong a week ago. "There is no other way because we have to rush to take advantage of the dry season in Laos," she said. Construction on the China-Laos railway project began on December 25, 2016, but Chinese companies have sped up work on the project since the first day of the dry season, which is the main construction season in the Southeast Asian country. Specifically for the China-Laos railway, it is necessary to create favorable conditions for construction before the rainy season. For example, the tunnel must be excavated to a certain depth before the rains start, otherwise heavy rainfall might cause a landslide. Once completed, the China-Laos railway will run 414.33 kilometers, more than 62.7 percent of which will be over bridges and through tunnels. The railway will connect the Mohan-Boten border crossing in northern Laos with the country's capital of Vientiane. The railway's trains will travel at designated speed of 160 kilometers per hour. The 40 billion yuan ($5.8 billion) project will take an estimated five years to complete. Chinese investors put up 70 percent of the funds for the project. The rest came from investors in Laos. The China-Laos railway is the first foreign railway route using Chinese technology, equipment and investment to connect with China's railway system. 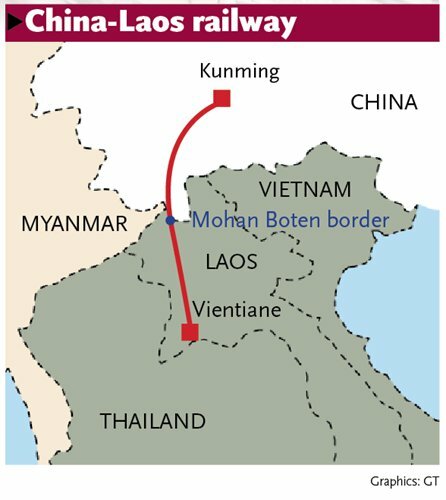 The China-Laos railway is a major strategic project that has been promoted by the top leaders of the two countries. Speaking at the project's ground breaking ceremony in late 2016, Huang Difu, general manager of China Railway International Co and chairman of Laos-China Railway Company, said China Railway Corp will leverage its advantages in railway management, technology and resources to lead other enterprises on survey and design, as well as construction and equipment manufacturing for the project. It will also cooperate with the Lao government and relevant enterprises to ensure the project proceeds smoothly. Huang pledged to resolutely implement the consensus reached by the two governments on railway construction and operation. Based on initial results, the company will continue to strengthen communication and collaboration with the government of Laos at all levels, support one another, follow the plan and requirements to ensure high quality standards and maintain a tight schedule, helping to boost the socioeconomic development of the two countries and the prosperity of their citizens. China Railway No.2 Group Co is responsible for the construction of the Muang Phonhong section of the railway. He Hongsong, head of the group's construction commanding department, told Xinhua that the department held a meeting in early April to launch a campaign called "the 100-day dry season working competition" to meet the goal of commencing "full construction" in June. 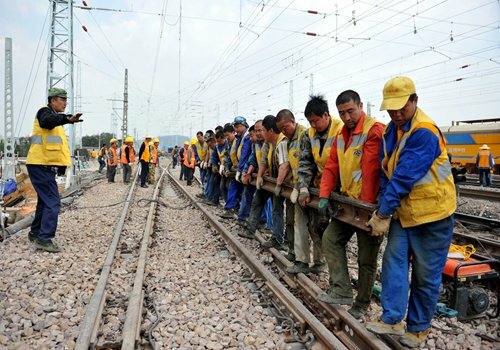 "We need to rush into the site and establish a safe, high quality working environment within 100 days to show the construction capabilities of Chinese railway companies operating under tough working conditions," said Huang Ningshu, Party secretary of the construction commanding department. At the same time, the Laos side is also promoting the progress of the China-Laos railway project. At the end of March, construction materials and equipment for the project were held up at customs in Laos. In early April, the Lao government established a working group to approve the tax-free import of the materials and equipment. It also set up a special lane for imports related to the construction of the China-Laos railway. On occasion, villagers living near the construction site of the China-Laos railway project in Muang Phonhong have taken their children on motorcycles to see the site. One Muang Phonhong villager told Xinhua that some of the villagers have been helping out with related demolition projects, while the initial construction of the railway has benefited local residents. "It is now easier for villagers to find jobs, and the sales of agricultural products are better," the village chief told Xinhua.